Bass fishing popularity is booming as of late, with hundreds of new lures, sporting clubs and tournaments appearing every day, it can be daunting as to finding a place to start out. Today we will take a look at the most commonly used lures for bass fishing, they are tried and tested lures which will no doubt bring you closer to catching your first bass. There are two types of bass, largemouth and small-mouth, largemouth are voracious eaters, they will take on almost anything that will fit in their huge mouth, most people prefer to fish for largemouth and find locations for them first, as it is the easiest way to get your first fish. There is some difference in fight between the largemouth and small-mouth, with the largemouth being known as easier to catch, so gaining some experience fishing in areas with largemouth is ideal for beginners. Largemouth can be caught on live minnows, taken via a small landing net swiped through the waters were you are fishing, then hooked through the lower jaw and cast back into the water. Other popular baits are worms and freshwater crayfish. For lures, they are known to take surface poppers, streamer flies and plug style lures. For deeper waters, soft plastics or spinner-baits are recommended, these should be used in weed-less set-ups, for spinner-baits this is easy as almost all come with a single hook on the end, you want to avoid treble hooks because getting the lures into the weeds is where you will find the bass hiding. For soft plastics, a shaky head type lure set-up is best to keep it weed-less, but there is also other kinds such as the screw front weed-less jig head, for with both are as effective as each-other. The screw front is just a large hook with a screw end, while the shaky-head often has a metal rod extending above the hook, you feed a soft plastic grub either through this small metal rod, or screw it into the front of your lure to fix it in place. 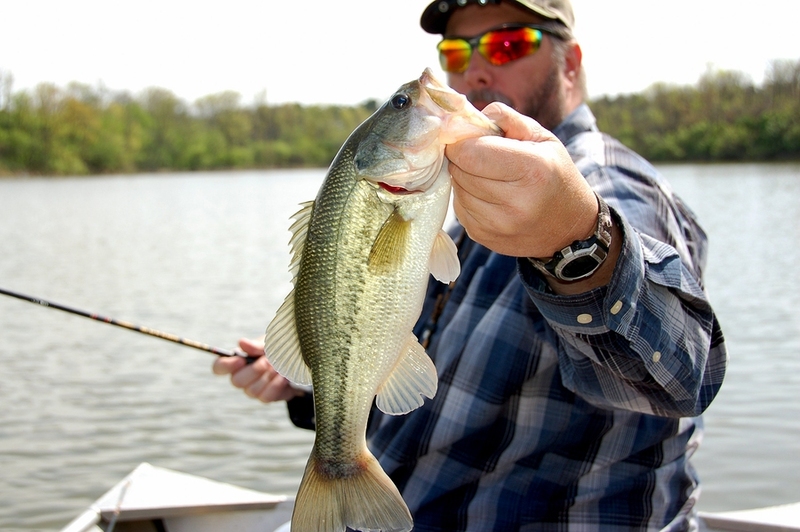 The best time to fish for largemouth is on warmer days, as they are not as active in winter or very cold waters. Smallmouth bass are a lively bunch, great to hook onto and they fight like a largemouth only much more erratic. It is a lot of fun and you definitely know when you have hooked into your first small mouth, a great fight is definitely going to be had straight from the hook up to the landing net. This type of bass love hiding in rocky streams and lakes, with it’s favourite foods being freshwater crayfish. To catch crays, you only need to throw a bait trap into the water with a little bit of raw chicken inside, come back after an hour and take a look, if there is crayfish in there, you are ready to go bass fishing. Hooking a cray is not a difficult process, their hardened outer shell makes them easy to live bait, you want to turn the crayfish over and hook it between the legs curving the hook so that it exits via the top of the cray around the third row on the exterior. For people who want to get this over and done with faster, hooking directly through the tail at the number 3 section without turning the cray over is also a quick but less reliable method of hooking them up. Many people prefer to cast crays out on heavy sinkers, as this limits the movement of the cray in the water to the length of the leader. Rest assured however, they won’t be burrowing into the sand while the hook is through them, they will be trying as best to fight so that the hook is dislodged, so casting them into a nice open area will attract small-mouth into taking an easy meal. For larger waters such as lakes, casting the crayfish out on a float can also work, this is good because as the cray fights and moves around, so does the float, provided there are no exposed snags coming out of the water, this method is very reliable in lakes where the bottom may be full of a lot of snags from driftwood, but the surface is nice an open. Artificial lures also work for small-mouth, but as their preferred prey is crayfish, using crayfish style lures are a good choice. These can be anything from a lifelike representation, to something more basic like a grub with a tail, the best colours however are those similar to the crays found in the water. Smallmouth are not a very social fish either, so keeping quiet and hiding yourself from their view in the water is needed to some degree, and will result in not spooking them away from your bait or lure, keep fairly still with no sudden movements when fishing using artificial lures and you should be good to go. No special rods are really required, apart from the fact that you want a light weight rod if using artificial lures, if bait fishing, basically any rod will do. In rivers or lakes where the weedbeds are further out, you may prefer to fish using waders, these are plastic cover alls, which will waterproof you up to your chest, meaning that you can get further into the water and cast easier into weed beds, you will however need your stealth about you when wading, sudden movements will easily spook fish. Previous story So you think you want to do some Alligator Gar fishing?